Are you a business-to-business company that collects payment for goods or services via a traditional, printed and mailed, 30-day invoice? You may be so accustomed to your B2B invoicing practices that you haven’t stopped to consider how they might be updated and improved. You can actually save time, and get paid faster, with online invoicing—even if your business doesn’t have a website. The ability to receive payments electronically isn’t limited to large, tech-savvy businesses with an established online presence only. Companies of all sizes, online presence or not, can take advantage of the benefits an electronic B2B billing system brings. (And it’s easier than you think to get started!) Keep reading for four benefits of online invoicing—and why it’s time for you to consider making a change. 1. You can collect payments faster. Your existing invoice process is probably fairly lengthy: manually generate invoices, send them out, wait 30 days or longer to receive checks, deposit funds in your bank account, and record invoices paid. To say that’s a slow cycle would be an understatement. And a slow payment cycle compounds the issue of slow-paying customers. A too-lengthy payment cycle impacts cash flow, which could mean the difference between staying in business or not; it could also limit your ability to make future business investments. Collecting payments on time and faster is good for everyone involved. Want a fast payment solution that’s convenient for your customers? See how online invoices can improve your cash flow. With B2B online invoicing, you can use a billing or accounting system to automatically generate invoices for you and email them out, then integrate that capability with a payment processor like BlueSnap. Our ChargeLink solution lets you email or text customers the link to a customized payment page (developed by us), where they can securely input their payment information. You can even embed this link behind a “pay now” button on an invoice. And even if the customer takes the full 30 days to type in their credit card information, you’ve cut out so many other steps from the cycle—including manual invoice generation, mailing of the bill and the payment, and depositing funds—that the end result is faster payment to you. 2. You minimize the impact of unsuccessful payments. Your customers may not send out paper checks until the deadline is looming; then, if there are insufficient funds you’ll have to chase those customers down again and the process drags out even further. Although it’s possible for you to allow customers to pay an online bill with a paper check (all the same payment options are available with an online B2B billing system as with your printed bills), most companies strive to get payment electronically. That means encouraging options like credit card payments, electronic checks, or business PayPal account payments rather than paper checks. One of the advantages of credit card payments is that you’ll know immediately whether or not the funds are available. If they are available, they’ll be on their way to you in just a few short days. If not, you can display an error message that directs the customer to try another card, resolving the issue right then and there—and shrinking the cycle even more. 3. You gain operational efficiencies. Online B2B invoicing reduces the work involved for your finance or accounting team. With traditional paper checks, your team spends a lot of time manually generating invoices and sending them out, as well as depositing the checks received. 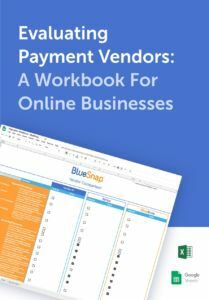 You could set up an online B2B billing system that automatically generates and sends electronic invoices, and includes an integrated payment processor like BlueSnap to handle receiving payments electronically. The time saved processing checks will free up your accounting team to do more high-level tasks. 4. It’s more convenient for your customers. Some of your customers may prefer to pay with a business credit card or a corporate card, either to earn rewards or because it helps them better manage their spending. And sometimes invoice recipients will find it easier to pay with a corporate card because they are not authorized to write a check on behalf of the company. Small business owners in particular—whose own personal funds are sometimes closely intertwined with those of the business—may also appreciate the convenience of paying by credit card. For customers who prefer to share payment information with you over the phone, consider solutions like our own Virtual Terminal. Virtual Terminal lets you accept credit/debit card and ACH payments by phone, email, or fax; you can even set up recurring payments for subscriptions. In this case, you have control over when invoice payments are collected and submitted for processing. More control means more on-time payments. Interested in knowing more about how online B2B invoicing works? Whether you have a website or not, you can implement a B2B billing system online that will help your company take full advantage of all the benefits listed above. (If you use Salesforce, connecting with BlueSnap’s payment gateway makes it even easier to get started using online invoices!) Visit our website to learn more about Virtual Terminal and ChargeLink, or get in touch and ask us anything. Previous Story Multiple Payment Gateways: Should You Consolidate To One? Next Story B2B Payment Processing: How Do Electronic Payments Work?